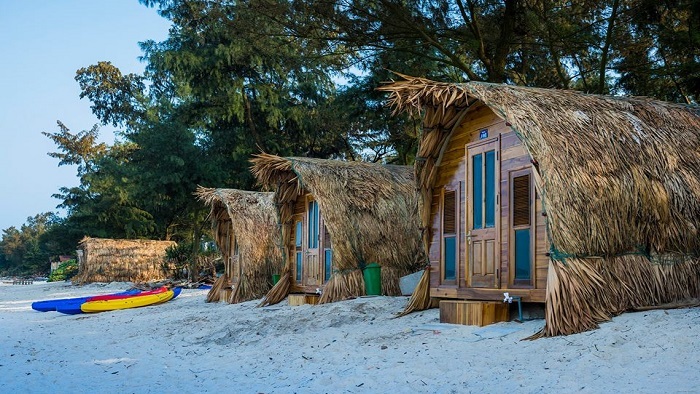 Located in the offshore of Quang Ninh province, Co To is a new traveling paradise in the trip Hanoi to Halong for tourists who want to have the best photos and experience the new beauty of the sea and beach. 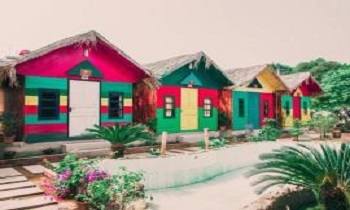 With the unique designs in both traditional and modern, the homestays in Co To island become the tourist phenomenon that tourists addict in this year. So, today we are here to recommend to you to 4 beautiful homestays in Co To island for you guys. Let’s read it till the end. Coto Village is an environmentally friendly homestay located next to Hong Van beach on Co To island with a romantic wooden tent system. It is regarded as one of the coolest stays on Co To island. The hut's roof has a unique design which is made of the leaves, the environmentally friendly material. You will have a wonderful experience when resting in the wooden huts scattered on the white sand dunes. Just opening the door, you can feel the cool flows of the sea breeze. Lazily sitting on the ground and enjoying the beautiful sunrise and sunset are such memorable things in life. What is more wonderful when enjoying a BBQ grill on the table next to the sea and between the pine forest right in front of the hut. The room price at Coto Village ranges from 560,000 VND to 1.2 million VND for rooms with a load of 2 to 6 guests. Container homestay is the hottest accommodation in this summer and it becomes the famous check-in spot for the young people when traveling to Co To island. 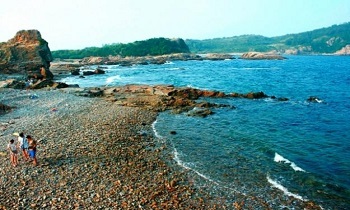 The homestay is located on Cai Chien island commune of Co To island district. This homestay with its unique architecture is the most ideal and novel spot with the colorful container rooms with the beautiful views of the sea. All rooms are made from the old containers that are redesigned and painted with multiple brilliant colors with the simple and convenient pieces of furniture. 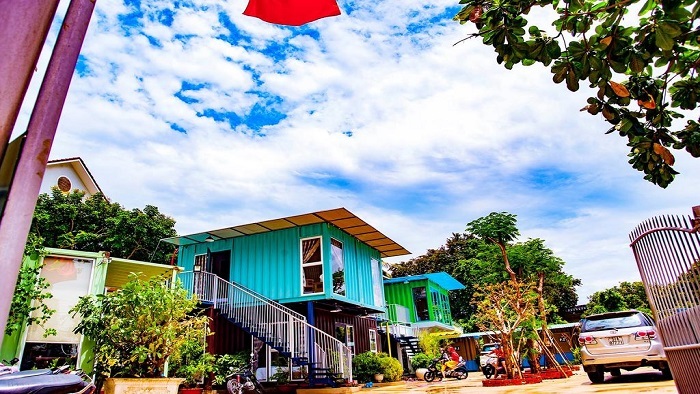 Each container has 2 double beds for 4 persons with the air-conditioning, private bathroom The most affordable price is 350,000 VND / room, on the holiday, it is about 500,000 - 600,000 VND / room. The Container homestay is located right next to the sea, in the romantic pine forest which has the cool breezes blowing during the day. You will have a very enjoyable experience here such as swimming, squid fishing, campfire, seafood barbecue, and sunrise. Coto Gardens is also an indispensable name in the list of homestay on Co To island that attracts guests to stay. 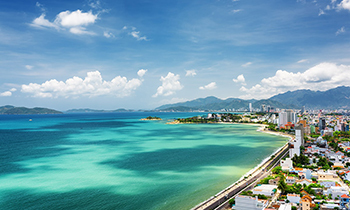 The homestay is located right near to the road leading to the two most beautiful beaches in Co To which are Van Chan and Hong Van. 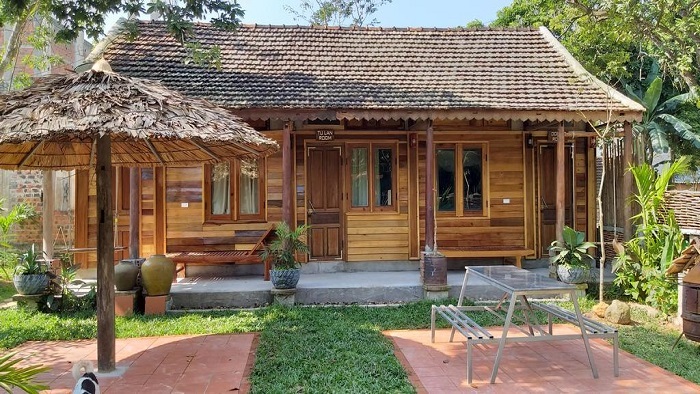 The unique feature of this homestay is all the rooms made of the wood with the unique shapes and eye-catching design. Coto Gardens is the image of the train car with the color is painted so eye-catching. 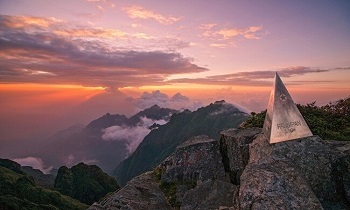 The homestay will definitely give you a very interesting experience to stay between the sea and cool mountain forests. The price of each "cabin" for four people is 800,000 VND/ room on weekdays and the weekend is 1 million/ room. If you agree to stay with other people, the price can be lower. Each room is equipped with 3 bicycles for free so you can move to the beach easily. Coto Gardens also has a free 2-way shuttle bus from the harbor to the resort and vice versa. 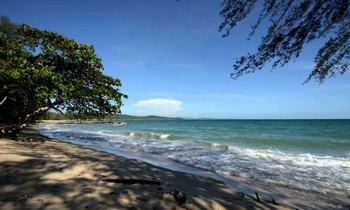 Only 100 meters from the beach, this is a homestay for those who love taking the beautiful photos. The price is 750,000 VND for 2 people for all days in a week including weekends and holidays. The pretty rooms are painted white extremely delicate. Coming to Coto Eco Lodge, you will be amazed at the beauty of the landscape surround and the architecture of the accommodation which is designed very delicate. The room rate is very reasonable, only 750,000 VND / room for all days of the year. The most enjoyable experience in this homestay is the BBQ on the beach with the price of 350.000 VND/ person. At night, in front of the twinkle of the wooden furniture, silk curtains, seafood, music, and wine, you will definitely have a romantic night that remaining in your mind forever. 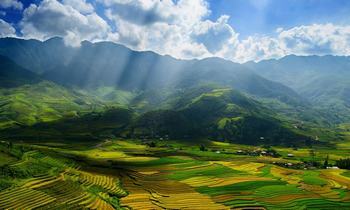 Co To is definitely one of the must-visit places in northern Vietnam. Besides enjoying the beautiful and wild landscapes, you have the relaxing days in the fancy as well as rustic homestays on this island. 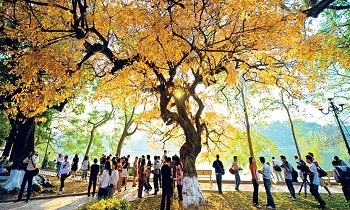 If you are interested in this post, please leave some comments to us via Vietnam package tour. Like and share this post with others. Thank you.